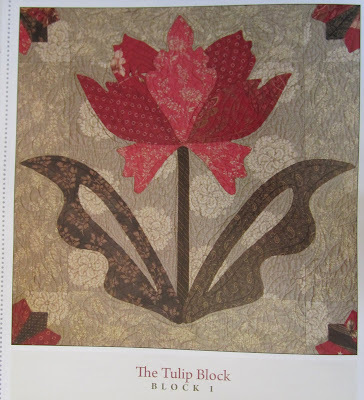 So here's what block one, The Tulip Block, looks like in the pattern book, Country Inn, by Blackbird Designs. The designer chose the original Rouenneries by French General gray medallion print for the background. I'm also using French General, but I'm going with the lighter medallion print from Maison De Noel. For the applique pieces, I'll be going with French General, but probably sticking mainly with the Maison de Garance family, I seem to be going through a red and brown phase right now. One of my pet peeves on other folks blogs, is when they show a perfectly lovely quilt, or block, then point out a mistake they made, something that I would have never noticed on my own, why point it out for the world to see? the left hand side doesn't match the right hand side, the right hand side is too low or too something, and the base of that flower petal in the middle, oh my, how wonky is that! The reason I'm showing you my poor needlework is to show you how much better it looked with a little more time and attention. 4 hours of time and attention, but worth every stitch, or restitch! So my very first hand applique block is all done, and I've already started on block two! Tomorrow is the Eventide Sew Along Update Post, if you have any updates for me to add to my post, send me an email, thanks! I started piecing the large quarter square triangle blocks, it took several tries, but I think I finally like what I've got. I'll share the pictures tomorrow. It looks wonderful Thelma! You're doing great and each block will only get easier (and will hopefully take less time)! Your first block is fabulous. I'm glad you're enjoying a new chapter in your quilting journey. I just bought the background for the applique I will be working on. I'm waiting on a pattern by Primitive Gatherings to decide to start on the planned piece or go with the new design, but I'm getting edgy and now that I see yours, I don't think I'll be able to wait. You did a wonderful job. I love it. Looks absolutely beautiful, Thelma. Such a striking pattern and made all the more striking by your choice of fabrics! I've been hoarding a lot of those French General line, waiting on just the right pattern on which to dive into them. I think you chose well! Your block is beautiful! I can't wait to see the next one. I have an applique block I did 4 years ago and have yet to start my second. I don't know what it is about them that fills me with dread. Love your applique and your choice of fabrics. It's been several decades since I've appliqued a quilt, and recently I've been feeling the call to make another one. Thanks for sharing this work. So pretty! Applique is a different mindset from regular quilting - nice for a change of pace once in a while. Thelma, you did a wonderful job. It looks very good. I wouldn't have noticed that place if you didn't point it out. Keep up the good work. Amazing! And this is your first applique block? That pattern is far from a beginner one! You did great. Thelma! I LOVE that pattern! You may inspire ME to do some applique. Although I will probably switch it to machine applique. 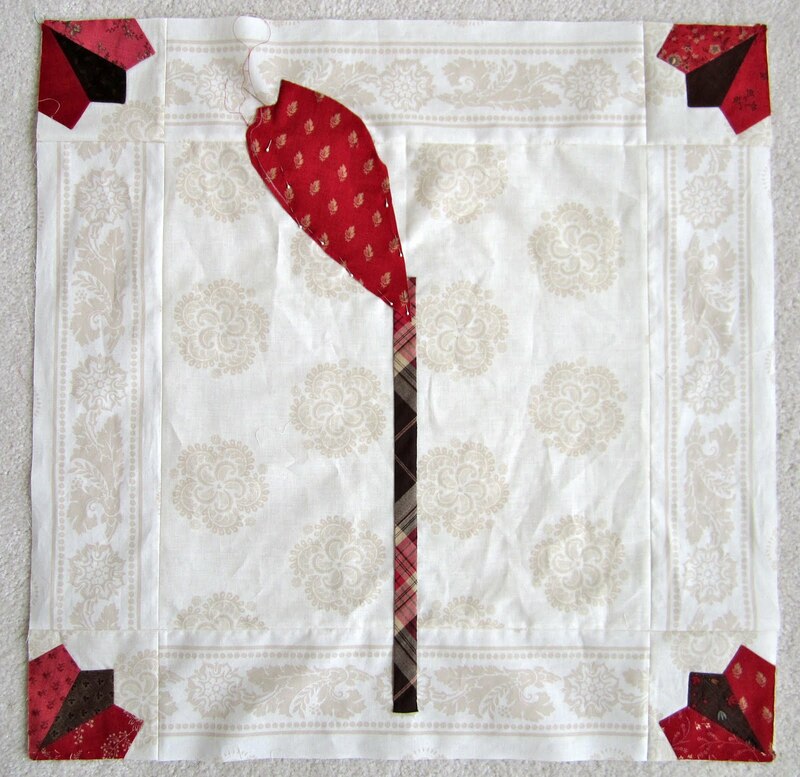 I KNEW you would enjoy needle-turn... did you get someone with the initials MS to teach you? Thelma your block is AWESOME!love you stem fabric. You did a beautiful job. It's amazing that this was your first applique block! GREAT job! Fabulous! It's so gorgeous! You really did a beautiful job! Bee-You-Tee-Full!!!! I love this block, and I love French General fabrics.